On Friday, April 21, the Newman University Staff Assembly hosted the 2017 Silent Auction. Proceeds from the auction were shared between the Newman University Helping Hands Fund and Starkey — a local, non-profit organization that helps adults with developmental and intellectual disabilities live more independent lives. Starkey was founded in 1930 by Hattie Starkey, and began as a school for children with disabilities. Today, Starkey serves more than 520 individuals, offering day programs, work placement opportunities, transportation, and living facilities for adults with disabilities. The 2017 winner of the “People’s Choice” traveling trophy is the Math and Science department. 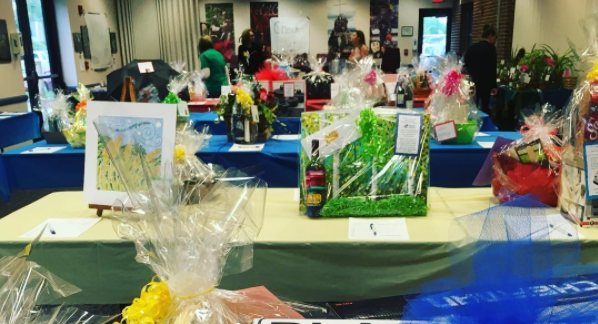 Newman staff and faculty joined forces to make this year’s silent auction a huge success. Departments put together themed baskets and were a big hit with bidders. 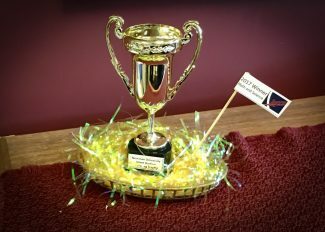 This year, a new award — a traveling trophy — was engineered for the “People’s Choice” basket. This honor is awarded to the favorite of all the department baskets and is decided on by popular vote. This year’s winner was the Math and Science department, who’s basket titled “Staycation” included a night’s stay at the Hyatt Regency, passes to local parks and museums, and gift certificates to local restaurants and spas. Above and beyond the department baskets, tables were filled with more than 60 silent auction items that included gift cards, date night packages, artwork, spa packages, handmade items and more. One of the most popular items this year, with a serious bidding war toward the end, was a “parking space for a year.” The winner of this item, Fr. John Fogliasso, was able to choose a parking spot in the lot of his choice anywhere on campus grounds. 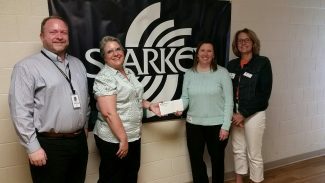 A check for $2,500 of the total $3,818.05 raised was presented to Starkey on Tuesday, May 23. Starkey Director of Development Ryan Heikes said he was very thankful for the donation. The Newman University Staff Assembly and the Silent Auction Committee is grateful for the overwhelming love and support from everyone who participated in the Silent Auction.